Maps of the measured DIB absorption in respect to the area they cover in our galaxy. Scientists have created the first 3D map of a type of astronomical interference that has puzzled astronomers for nearly a century. The new map could help scientists finally nail down the identity of the material that creates "diffuse interstellar bands" (DIBs) in observations of stars, the study authors said. "DIB 8620 does not seem special compared to other DIBs," lead author Janez Kos, of the University of Ljubljana in Slovenia, told Space.com by email. However, as a spectral feature often used to measure stellar motion, it is "the most observed DIB." The result was the first large-scale map of DIB interference, and the first three-dimensional study of the DIB-bearing clouds in the interstellar medium. Astronomers break the light streaming from distant stars into prismlike lines called spectra, separated by wavelength, in order to determine what stars are made of. Some of the light is absorbed by the material it passes through along the way, creating absorption bands in the data. While some of the bands are caused by cool gases in the stars' atmospheres, diffuse interstellar bands have remained a mystery since their identification in 1922. These bands are spread across visible, infrared, and ultraviolet wavelengths, and correspond to no known atom or molecule. Some of the first proposed sources were molecules on dust grainsbetween stars, according to Kos. It has also been suggested that the strange absorption bands are caused by carbon-based molecules that are either simple or in long chains. "None of these were ever proved to be the carriers," Kos said. In order to investigate DIB 8620, Kos and his international team of astronomers turned to the Radial Velocity Experiment (RAVE) survey of stars in the Milky Way created by the Australian Astronomical Observatory’s Schmidt telescope. RAVE contained the spectra of almost half a million stars across the galaxy, all located in the southern sky. Using the measurements of DIB 8620 in the spectra of the stars, Kos and his team created a map of the interference source across the galaxy, measuring the density of the material by how strong its absorption line is in the stars detected by RAVE. The data taken from the survey revealed the distance of each star, allowing for the 3D mapping of the material in the interstellar medium. 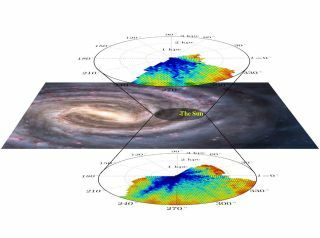 The scientists then compared the DIB map with an independently constructed map of the interstellar dustalong the plane of the galaxy. While the results are similar, the two maps don’t match up precisely, suggesting that there is a "strong correspondence between the two," according to the research paper. Rising above the plane of the galaxy, the density of the source for DIB 8620 drops more slowly than the density of the dust — a surprising find since the two sources otherwise align fairly well. "Even though the correlation between the DIB and dust is good, the two components do not share the same distribution in the interstellar medium," Kos said. These maps show the amount of light absorbed by the DIB (left) and the dust between stars (right). Red indicates that more light was absorbed than blue. The top maps show the northern galactic hemisphere, while the bottom row shows the southern galactic hemisphere. The implication is that "DIBs experience a mechanism of their own during their creation and migration through the galaxy," Kos said. The team cautions that these implications should not be extended to all DIBs, as different bands demonstrate different behavior. However, the techniques used to study DIB 8620, combined with other surveys of the Milky Way, should allow for similar maps to be made, narrowing down the source of a century-old mystery. RAVE limited the team to studying only a single band, but different surveys should allow for the study of some of the other 400-plus measurements. The research was published online today (Aug 14) in the journal Science.